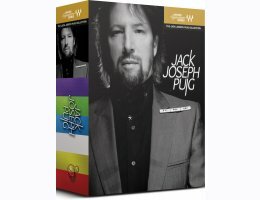 The Jack Joseph Puig Collection are six application-specific audio plug-ins created in collaboration with iconic Grammyï¿½-winning producer/engineer Jack Joseph Puig. Iconic Grammyï¿½-winning producer/engineer Jack Joseph Puig and his personal palette of tones, shades, and hues have illuminated and empowered a kaleidoscope of projects that have spanned commercial record making. His vivid and vibrant productions have defined and redefined the sound of contemporary pop, rock, country, and urban music, time and time again. "Every track is different. And every bass track is different. Sometimes you want just a great bottom; other times you want something with more mid-range that cuts through a mix. You may want to give it a bit of distortion, give it an edge. Or you'll want to shape the sound with some nice bell EQs, use some compression and gate to lock it with the kick drum. I could even see someone using this plug-in on the drums of a hip hop track as a sub enhancer, to give it some attitude. JJP Bass is a plug-in that could be used in any situation." "There are certain things you usually just take for granted when you're mixing drums. Sure, the snare has to snap. Or maybe you want it to have a woodier sound. The bass drum has to have a nice bottom. But beyond that, there's a whole other range of things you need to consider to really make the song come alive. Maybe there's some tonality in the drum kit that you want to emphasize. How do the drums relate to the rest of the song? And once you figure all that outï¿½how do you get there? Well, what's really great is, JJP Drums is a plug-in that can do it all." "When I'm dealing with strings and keyboard parts, in general I want them to be radiant and beautiful. I want to shape the tonality to fit what the song needs to be, so when it comes out of the speaker, it's on another level. With JJP Strings & Keys, it's set up so you can really follow your instincts, to bring out the complexities in your keyboard parts and orchestrations. You might want to use some delay and make it wider, or add a little air for a more ambient feel. Sometimes you'll want it dry and in-your-face. Whatever I do, it has to serve the song." "There's really so much you can do with cymbals and percussion. You can use some lo-fi effect to fatten up shakers. You can take out the mid-range on tambourines to make them sound brighter, or you can add some dirt and distortion to make them sound grittier. You can boost the high end to enhance the shimmer of the cymbals or compress them hard, to bring out other aspects of their sound. The JJP Cymbals & Percussion plug-in gives you instant access to all the different colors I like to use, so you can just fire it up, find what you need, and stay creative." "When I mix a vocal, my approach is intuitive and instinctive, not technical. I don't think in terms of 'which delay' or 'how to EQ it' or 'more compression' or whatever. What concerns me is how it makes you feel. And since each singer is unique, and every song is unique, there's no single way to go about it. Is it personal, is it intimate, or is it loud and aggressive? So I do whatever it takes to make sure the vocal is open, sits well in the mix and, most importantly, helps convey the message of the song. JJP Vocals helps get you there."